Real use cases, no theory! 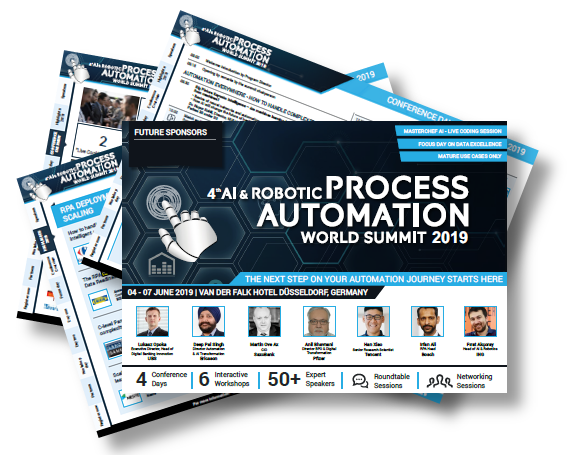 Join the leading international AI & RPA practitioners in Düsseldorf between 04 - 07, June 2019 for the 5th AI&RPA World Summit, to discuss opportunities for robotics and how to scale-up RPA. Gain insights into how to leverage on cognitive technologies to robotize end-to-end. Find out more and read the conference agenda here for free. Real use cases, no theory! Join the leading international AI & RPA practitioners in Dusseldorf between 04 - 07, June 2019 for the 4th AI&RPA World Summit, to discuss opportunities for robotics and how to scale-up RPA. Gain insights into how to leverage on cognitive technologies to robotize end-to-end. Find out more and read the conference agenda here for free.